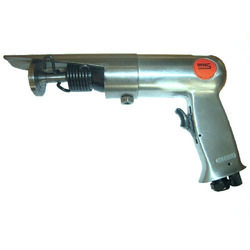 NITYO Air Hammer, Air Inlet Size: 1/4"
Piston Stroke: 4", 2-1/2", 2"
There is a power magnet inside the air hammer. As the inlet air pressure is higher than the magnetic force, the hammer & magnet will separate and cause strong impact power. Spring would hammer back the magnet to its original position after the impact. This will help smooth the flow inside the container. We are proud to be the leading manufacturer, supplier, trader and exporter of Light Chipping Hammers. The compact and slim design of our Light Chipping Hammers makes it highly suitable for digging, chipping, making channels and holes in concrete or any horizontal and upright application. 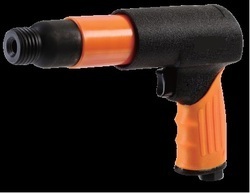 - Over 40 models of power tools : including popular metal bodied tools and Double Insulated FRP body tools. Skatool Triple Head Scaling Hammer, Sf3, Air Inlet Size (npt): 1/4"
Air Inlet Size (NPT): 1/4"
Chisel Shank: Round- 0.401" Hex- 0.410"
Rivet Diameter: 3/16", 1/8", 5/32"